So how can you make something that is as wide as a (modest) household lot and as high as 100 feet and has the heft of hundreds (thousands?) of cubic yards of steel and cement invisible? As I wrote last time, in what it seems now was the first installment of lessons for science and popular culture from art, it's a very simple sleight of hand: leave it unclassified. 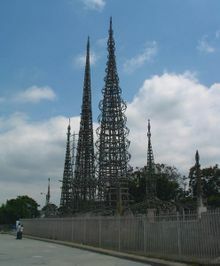 As Calvin Trillin remarked in the New Yorker in 1965 about what came to be known as Sam Rodia's Watts Towers in south-central Los Angeles, "If a man who has not labelled himself an artist happens to produce a work of art, he is likely to cause a lot of confusion and inconvenience." The problem in classification had been created through the decades-long labor of an Italian immigrant who, the correspondent from NYC explained, "constructed a dream-like complex of openwork towers . . . and encrusted them with a sparkling mosaic, composed mainly of what had once been refuse." A book without a Library of Congress call number can't be shelved, and may as well not exist -- you won't find it in the art section. Of course, even if forced by circumstances to classify something that is confusing and inconvenient and made out of refuse, we can assign it to a category that still renders it hard to see: say, label it as popular culture, not Art. In the part of the scholarly map where I work, the stuff that relates to science but that isn't produced by a scientist also creates category problems: if it's stuck in the ephemeral -- the category of "popular culture" -- it is hard for professional historians of science to see it (or to take it seriously). If it's not scientist-produced and approved -- and therefore solid and visible -- then why would a historian of science study it? Another category problem. Fifteen years' experience building models for Hollywood movies [such as Blade Runner] and an abiding love of craftsmanship is visible in the amount of technical finesse applied to these intricate constructions. McMillen's passion for junk is evidenced in the huge stockpile in his backyard. Items such as plumbing valves, door hinges or typewriter keys provide impetus for his conceptual fecundity. He likes his process to be ongoing and interactive. In fact, works often appear to be in an evolving state. The viewer is brought into the process of invention and discovery. McMillen juxtaposes objects to evoke associations and to investigate the fine line between illusion and fiction. The transmutation of matter, how it disintegrates and is reborn, inspires his art. Scientific logic and the nature of matter are terrains that often remain obscure. But he attempts to demythologize them. In the process of building his imagery he plays with the psychology of perception and the ideas those images might convey. As someone who was set to return to graduate school (not to study cognitive psychology, like before, but history of science instead) I loved visiting his installations and gallery shows, which through the richness of the juxtapositions and layerings and their surprises and resonances raised all kinds of interesting questions about the meaning of science and technology as past and present for me. The artworks were always the effort of one mind seeking to convey ideas and emotions to other minds, but without dictating results, leaving room for viewers to discover and interpret and reimagine. McMillen's installations were partnerships with his visitors, sometimes literally, as when their actions became part of the exhibit themselves. He once remarked that he "wants viewers to interpret his art according to their own experiences. . . 'I suggest, rather than shout.'" (from Patricia Hamilton, Michael C. McMillen: Hermetic Landscapes, 1988). Suggesting, rather than shouting. . . this was part of what I loved about these carefully constructed worlds of McMillen's and why they seemed so engaging to me. And here's this second lesson I learned, although it has caused me no end of uneasiness in becoming an academic historian of science. Our disciplinary rhetoric, our blunt-edged forms of persuasion such as the scholarly monograph and the professional article, are built on an argumentative platform that seeks to marshal evidence and drive home a thesis, in order to engage almost in a battle with the minds of readers to convince them that they must understand what we are writing about in just this one way. Especially within the history of science, which frequently seeks to emulate the sciences themselves, our histories often proceed as if they were clever, neatly contained scientific experiments, in which we deploy independent variables to find out if our hypothesis is judged to prevail or not. This professional mode was coming up against a set of changing dynamics, however -- something that cultural anthropologist Clifford Geertz observed in 1983: that a "blurring of genres" was occurring within intellectual life, with "many social scientists hav[ing] turned away from a laws and instances ideal of explanation toward a cases and interpretations one, looking less for the sort of thing that connects planets and pendulums and more for the sort that connects chrysanthemums and swords." He characterized this shift as a contemporary "refiguration of social thought," summing it up in this way: "something is happening to the way we think about the way we think." I could see this shift all around me, as with McMillen's installations. But Geertz's shift didn't seem all that real when dealing with the print culture of academia in which I was being trained for. So, what I wondered from what artists such as McMillen had taught me is this: what does the rhetoric look like for less martial, less adversarial histories of science? Why not histories of science that instead view the reader as a partner in meaning-making, that strive to evoke, and broaden, and recalibrate, and suggest, and raise possibilities rather than seek to have the last word (reject the null hypothesis)? What category would this kind of history of science fall into, this kind of art-inflected narrative, one based on picking up the flotsam and jetsam discarded by the mainstream, reworking it, reconsidering it, recategorizing it, blurring genres? I left California in 1994 for Oklahoma, and haven't been able to follow McMillen's work in person, although the web makes possible a bit of visiting at several removes. And it's a delight to see that among the numerous and fascinating turnings he's taken that he's found unusual ways to bring his reflections on humans and history and science and technology to new and different locations: whether just this last year at the San Jose Museum of Art, for their group exhibition on "Robots: Evolution of a Cultural Icon". . . or CalTech, with "Dr. Crump's Inductive Geo-Imaging Mobile Laboratory (Field Unit 1)", where visitors would see an "ever-evolving archive of artifacts" from the research being conducted of, he revealed, a series of buried chambers from an underground abandoned laboratory, sealed off over seventy years before. . .or Geologica 42, at the LA Metro Fillmore station . . . or the joint experiment by the Natural History Museum of Los Angeles County and Naturalis (the Netherlands' national Natural History Museum in Leiden) that he and a handful of other artists participated in, "Conversations: Nature and the City," featuring his Crocodelephant Incognitus Giganticus and the "The Flying Dutchman" (the porpoise skeletons with schooner sails above to the right). When the exhibit set up in Leiden a real scientist came by to look over the artists' pieces and deliver a prouncement: Philip Campbell, an astrophysicist and editor-in-chief of Nature (his review, "Conceits and Provocations: Artists Reveal a Variety of Responses to the Contents of a Natural-History Museum," appeared in the 16 November 2006 issue, p. 274). His final conclusion about artists in a museum context is that: "Cumbersome attempts by artists to pose philosophical questions in a visual form tend to smack of conceit, rather than stimulate," although he allows that the closer that the artists get to "artfulness" -- which he defines as "sheer visual creativity" -- the better they do. I wish an historian of science had also reviewed the exhibition, to see what further conversations might have resulted! Campbell finds McMillen coming off somewhat better in his mind than did some of the others, giving him an evaluation of being "conceptually more substantive" and displaying a "sense of visual play that adds to the cultural value of the specimens." He also seems to endorse the statement in the organizers' supplementary material that "McMillen's creativity is closer to the way our brains work than we might want to admit." McMillen himself speaks of his Naturalis creations, which play off of nature's creations, as "all part of an open-ended narrative, a carnival for the curious." Perhaps this is what leads "print" historians like me (who spend too much time haunting artists' venues?) to venture out into the digital world -- searching for a contemporary space that allows room to mount a carnival for the curious with open-ended narratives allowed, even necessary. Ephemeral? It depends on what categories we navigate by . . .
For more: McMillen's most well-known Los Angeles installation is the fascinating "Central Meridian" (and here) which is part of the permanent collection at the Los Angeles County Museum of Art. If you're ever visiting LA don't miss it (or the Watts Towers)! You can also see a quick YouTube hit of a recent installation at Cincinnati's UnMuseum, Speed's Place. For more background on the artist, see this oral history interview that the Smithsonian Institution conducted with McMillen in 1997. Clifford Geertz's essay, "Blurred Genres: The Refiguration of Social Thought" is from his Local Knowledge: Further Essays in Interpretive Anthropology; the essay was first published in 1980 in American Scholar. Images: The Box of All Knowledge (photo by Brian Forrest) accompanies an essay on McMillen at http://artscenecal.com/ArticlesFile/Archive/Articles1997/Articles0697/MMcMillen.html; the album cover is at wikipedia; the porpoises image is from the Natural History Museum of LA County website for the exhibit, at http://www.nhm.org/Conversations_LA_Leiden/?artist=mcmillen; and the CalTech lab accompanies an article by Michael Rogers, "When Art and Science Collude," at http://pr.caltech.edu/periodicals/caltechnews/articles/v38/collude.html. Why would anyone who is an historian of science spend their time thinking and researching and writing and lecturing about science and popular culture? Isn't it a sideshow to the real stuff, the important stuff: professional science? Recently, I found myself answering a variation on this question from someone who had come to a talk I was giving to an academic audience, and somewhere along the way of answering, I brought up the issue of cultural gatekeeping -- how specialists in areas like art and literature and music in the early twentieth century would have said that Charles Dickens wasn't "real" literature or jazz wasn't "real" music because it wasn't "real" capital C Culture (how we got the capital C categories is of course an interesting legacy of latter-nineteenth-century intellectual arbiters. For a provocative entry point, see Lawrence Levine's Highbrow/Lowbrow: The Emergence of Cultural Hierarchy in America / Harvard U Pr, 1990). Over the course of the 20th century there has been a widening acceptance within most fields of human activ ity about what counts as significant, even if it seems to fall within the area of popular culture rather than clearly fitting into what arbiters considered to be high culture, or serious culture. But science is an area that has been much more tenacious in marking out and keeping firm the demarcations between what is seen as important and what has been brushed off as peripheral, tangential, trivial. The cordoning off of science as high culture is an important historical divergence from other cultural areas, in my view, and one worthy of thinking hard about, just like we used to wonder why Charles Dickens couldn't be real literature, or whether or not a quilt could be considered to be a form of artistic expression, even if it covered a bed in someone's home rather than being displayed on a museum's walls. The example I gave was one that means a great deal to me: an Italian immigrant's set of sculptures that he created in his backyard f rom the 1920s through the 1950s. There are seventeen structures, two of which are towers that reach nearly 100 feet high. They were created out of steel and cement and the discards of everyday life -- broken pottery, tiles, bits of soda and milk of magnesia bottles, and seashells brought to him by neighborhood children. If The Watts Towers — built by one man using novel construction methods — could withstand 10,000 pounds of stress,The Towers would be spared. On October 10, 1959, 1,000 supporters held their breath as they watched Rodia’s structure weather — without signs of strain — the equivalent of seventy-six mile-an-hour sustained winds. It was, in fact, the testing apparatus that began to bend. The demolition order was revoked and a year later The Towers were opened to the public for a fifty-cent entry fee. I first saw them about 1975, when a high school teacher took us on a tour of cultural artifacts in downtown Los Angeles -- the kind of artifacts that you wouldn't find inside a museum, that is. I was astonished by the towers, by the fact that they were so intricate and so complex -- by the fact that they rose out of a modest urban neighborhood with a kind of nonchalance as if of course every neighborhood should have its local artistic embellishments -- by the fact that they had been created by someone who had no formal training but nevertheless felt compelled to invent and improvise and design and make real the visions inside his head and heart over so many years. But most of all just looking at them and walking around them made me very, very, very happy -- even if there were many things wrong about the world I felt a kind of joy that I could live in a time and place in which they could exist and I could experience them and that we were bound together because I knew I would never forget them. And yet I might never have seen them if a small group of people hadn't argued for their value in order to save them, since the default view saw them as having little value, except, perhaps as a potential nuisance. What gets left out of the official story, what gets left behind, what gets forgotten, and why . . . that is part of the story of science in the vernacular. And lessons from outside of science itself can help us think about these questions, too . . . but only, of course, if you think of science as a form of culture to begin with. For more: There's wikipedia, and the local public television site for information, and a good summation of information on Rodia and the Towers from the documentary by Edward Landler and Brad Byer, I Build the Tower; see also an interesting interview with Landler. And here's Charles Mingus on growing up with the Towers. Images: The first two are from http://www.wattstowers.us/; the third one is via flickr by bisayan lady; the fourth one is from wikipedia at http://en.wikipedia.org/wiki/Image:Watts-towers.jpg.